The first day of winter brought winter-like weather to many parts of the country, including the Brecon Beacons. The temperature fell well below freezing the previous night, and in parts of the Grwyne Fawr Valley, where there's no sun at this time of year, the ground remained frozen all day. I headed to Pontrilas first thing for a 1Q18 test train, not the Flying Banana this time but a pair of Colas 67s sandwiching the test cars. After that I was off into Abergavenny, managing photos of the returning 1Q18, the 4V20 FF to East Usk and an unfeasibly early 6M86, between supermarkets. 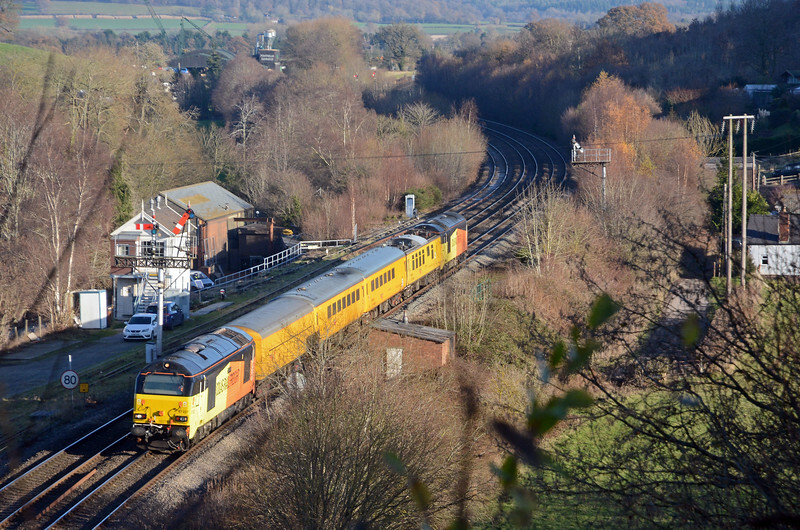 On Monday 4th the Northern Belle and 56096 put in an appearance on the Gloucester to Severn Tunnel Junction line. Sadly, despite promising forecasts, the weather didn't really play ball. Wednesday 6th was much better, I spent a couple of hours around Hereford for the 4V22 FF to E Usk, 6M45 Neath to Washwood H and the 3S91 RHTT with the 56s. The night of Thursday 7th brought the first significant snowfall of winter, although the railway around Abergavenny was barely affected. That changed on the following Sunday when our part of Wales received almost 12" of snow. Train services were badly affected on both Monday and Tuesday, mainly due to overhanging trees brought down by the weight of snow. By Wednesday 13th the thaw set in and our first winter event was all but over. On Tuesday 19th I paid a third visit of the year to Dublin, ostensibly to ride the new LUAS Green Line extension over the old MGWR from Broadstone to Liffey Junction but also to sus out what freight trains may or may not be running. I was pretty lucky. The night of December 26th brought more snow to the southern half of the country, albeit light and patchy. it quickly disappeared from lowland areas but stayed on the hillsides of South Wales for 48 hours or more.